I recently mentioned to a techie work colleague that the planes I fly typically have GPS. He was quite surprised that airplanes used GPS, and stood there and said in a very authentic GPS voice "recalculating… at the next cloud, turn left! ", which amused us both, probably for rather different reasons... (he may well end up flying with me sometime soon). All of which is to distract you from the fact that I didn't fly for nearly three months after injuring my shoulder (not too badly, but irritatingly) in a bicycle accident (like John, I ride a bike pretty much daily to get to and from work; unlike him, I do it all at a relatively leisurely pace, and I don't ride nearly as far…), and when I did get back in the saddle (with John in the right seat ensuring I didn't fly too badly), I ended up being unable to blog it in detail because I got sent elsewhere in the United States for work (as I often am) and promptly forgot to blog it. So what do I remember of the flight? It was supposed to be both a club refresher and a preparation for a potential instrument proficiency check some time in the ever-receding future, but due to some mild instrument issues it turned into a shorter club VFR refresher only. 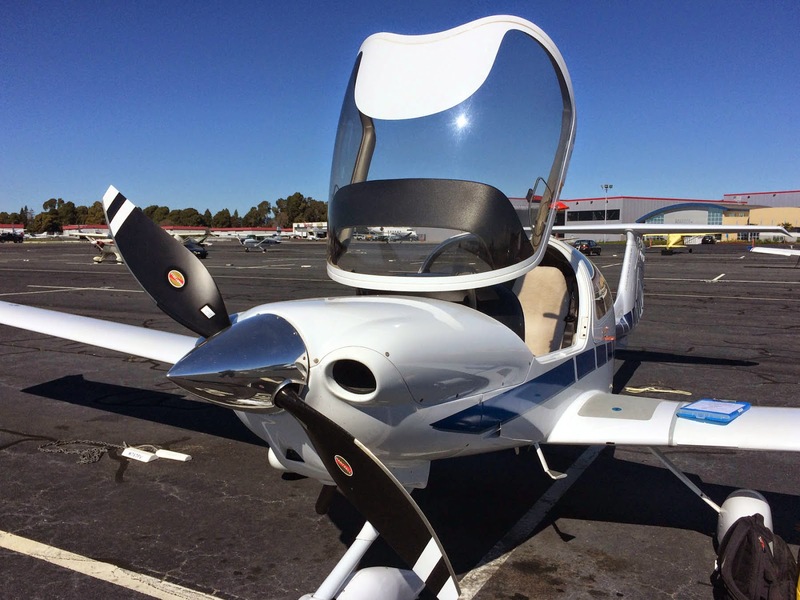 Still an enjoyable flight — in Arpad M's nice new-to-the-club DA-40 (above) — and at least I'm now legal to fly with the club again. I plan to fly a bit more in the next few weeks; we shall see….